It’s a strange thing indeed to be a nature writer. My subject is the great outdoors – that magnificent wildness – but I do most of my work indoors while staring at a computer screen. Hard to imagine a more contrary vocation. There are times, especially in the dead of winter, when I question my motives, my own sincerity regarding this. Is writing about nature really what I’m all about? Then comes the great thaw at the end of winter and the reawakening of the natural world in early spring and there’s no doubt in my mind where my heart lies. It’s my obsession, no doubt. While I read all kinds of books, few subjects captivate me the way a good piece of nature writing does. I’m inspired more by Emerson and Thoreau than by eminent philosophers like Kant, Hegel or Rousseau. The essays and narratives of John Burroughs, Farley Mowat, Richard Nelson, Annie Dillard and the like edify me more than the best fiction writers ever could. I take Copernicus, Darwin and Einstein more seriously than the greatest sage, and the poets who celebrate them are my prophets. There are the innumerable worlds that we can imagine, then there is nature – the world as it really is. I have an insatiable appetite for the latter. Whenever I am not tramping through the wild lands of the northeast, I work with books. 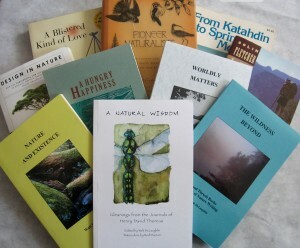 As a bookseller, I sell all kinds of books, but I make only nature-related titles available at my website, woodthrushbooks.com. 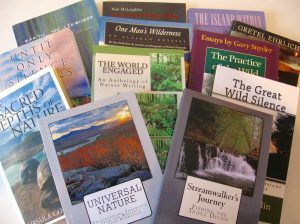 There I sell every kind of nature writing imaginable, including what I’ve written myself, or what some of my friends and favorite writers have written. 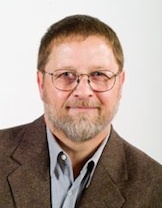 Through my small press, Wood Thrush Books, I publish the same. Every once in a while I put together an anthology of contemporary nature writing, if only to bring to light some of the lesser-known writers in the field. And I love doing all of it – bookselling, publishing, editing, and writing about nature. I’m lucky that way, I guess. Yeah, it’s a strange thing to be a nature writer – to write about the natural world as if it really mattered. There is also the human world, of course, but what I find interesting about that is human nature. And what I find most interesting of all is how we humans interact with the natural world. Is there anything that better illustrates what we are all about? I think not. 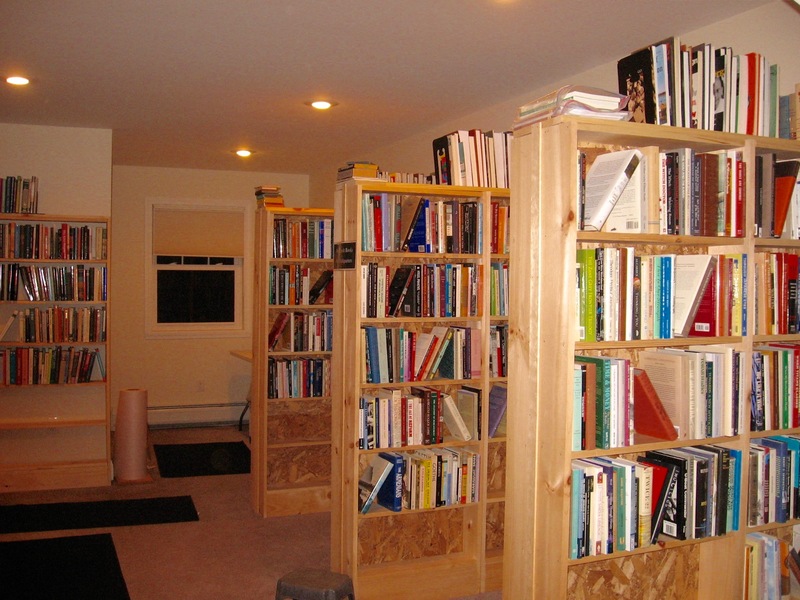 As most of you know, Wood Thrush Books is an on-line bookselling business in addition to being a small press. 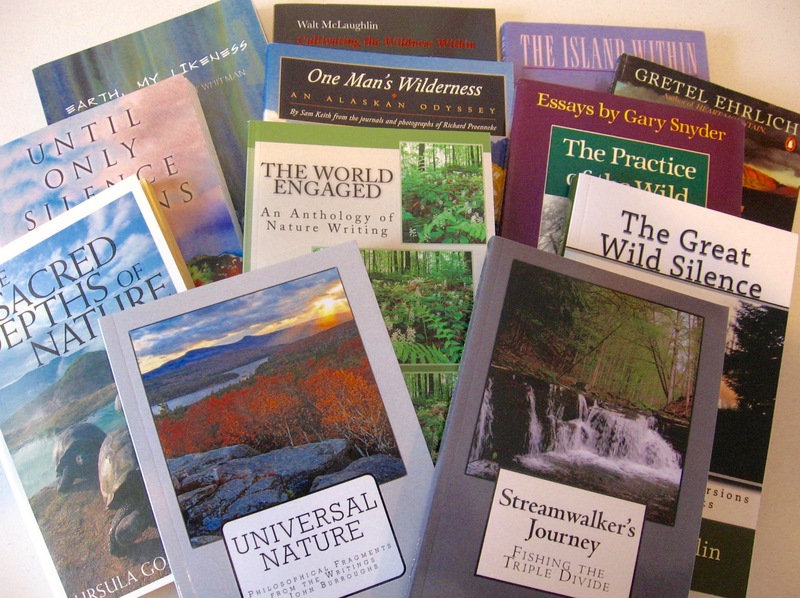 If you go to the WTB website, you can find over 200 used books on nature-related themes, along with the titles that I publish. But I have also listed nearly 2,000 titles at Amazon on a wide variety of subjects. Visit the Wood Thrush Books storefront to check out some of the books I have for sale at Amazon. I offer a little bit of everything. There’s a heavy emphasis on history, politics, philosophy, religion, literature, and natural science in my inventory because, well, that’s what I know. As far as children’s books, cookbooks or any kind of mass market fiction goes, I’m pretty much clueless. When Judy and I moved into our new home last June, I was able to dedicate an entire room to WTB inventory. I built 16 shelves right before we moved in, and nearly filled them by Christmas. Since then I have built an additional 6 shelves. That means I have space enough now for 3,000 books, in addition to my publisher’s inventory. Plenty of room to grow. To be honest, I don’t make much money as a writer, publisher and online bookseller, but I thoroughly enjoy the work. The only thing I enjoy more is being in the woods. My plan this coming year is to keep growing the book biz while getting outdoors as much as possible. A good plan, don’t you think? I’ll let you know how it goes. The renovated Wood Thrush Books website, featuring used books on a variety of nature-related subjects, is now up and running! Many of you have been hearing about this undertaking for months. With Judy’s help, I’ve finally turned a quasi-professional site into a bona fide online bookstore. To be honest, Judy did all the heavy lifting. She reconfigured the site so that browsing it is easy and making a purchase is even easier. All I did was upload a bunch of cover photos and book blurbs, which has been more time consuming than difficult. There are over 150 books at the site now, between used books and those published by WTB, and more on the way. Shipping is included, making these books quite affordable. The inventory system lets you know when a book is out-of-stock, and a third party securely handles credit cards. We can even do returns. Five months ago, I stopped working a regular job and put all my time and energy into building an online bookselling business. My wife Judy and I agreed that I would go gangbusters for four months then we’d reassess the situation. Well, when October rolled around the business looked good so I’ve continued doing it. It’s an unconventional way to make a living, no doubt, but I’m having a great time. During the past five months I have driven thousands of miles, hunting down all sorts of books at library sales, church sales, and thrift shops. 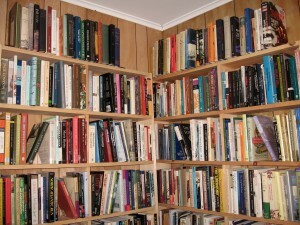 The bookshelves that I built in my office are packed from floor to ceiling. I buy books, list them at Amazon, and ship five/six days a week. It’s a hustle that suits my temperament well. I didn’t get out and hike as much as I wanted this summer and fall, but I figure there will be plenty of time for that in the years ahead. As for writing and publishing, I’ve done a little of that lately and hope to do more this coming winter. But building the business remains my top priority, even as the library sales taper off. Now comes phase two. 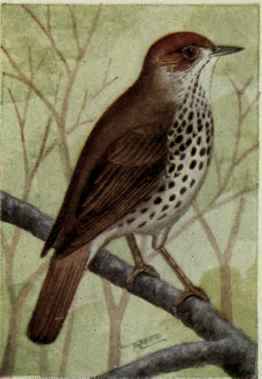 With Judy’s assistance, I am revamping the Wood Thrush Books website to make it more user friendly. Soon I’ll be offering secondhand books on a variety of nature-related subjects for sale there, in addition to the ones I publish. Some of you might remember my dalliance with online bookselling a decade ago. Well, this time I’m doing it right. Once the new WTB website is fully operational, I’ll send out word to all of you. That will probably happen in January. In the meantime I’ll keep listing books at Amazon and writing blurbs for the nature books to come. It’s keeping me busy, that’s for sure. Two weeks ago, I did something I have been dreaming about doing for years. I stopped working for other people and got back into the bookselling business. It began innocently enough. In April I posted several of my older books to Amazon.com, thereby making them available to a lot more readers. Go to Amazon, punch in my name, and most of my published work will come up now. That in itself felt like a major accomplishment – something I’ve been meaning to do for a long time. Then I took things a step further. I posted a bunch of other books to Amazon Marketplace, just to see if I could sell them that way. When orders started coming in, I was beside myself. I started buying and posting more and more books. Then two weeks ago, everything changed. That’s when I lost my job at the UPS Store. That’s when Judy suggested I take the next four months to focus on building the online bookselling business instead of looking for another job. I said we should sleep on it. When I got up the next morning, Judy gave me the high sign. Then I set to work like a man possessed. For quite some time now, Judy and I have been toying with the idea of having a retail operation in our latter years. But the more we looked into it, the less a bricks-and-mortar store appealed to us. Online seems a better way to go. I love books. I like reading, writing and publishing them. And yes, even selling them. 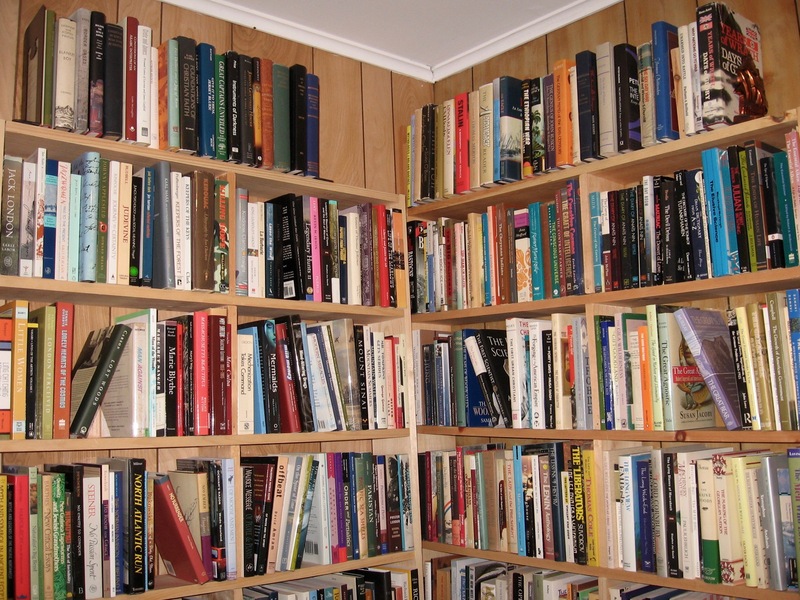 Some of you will remember when I had a store full of used books. That was back in the 80s. Well, it looks like things have come full circle. Naturally I favor outdoor/nature books, but I’m trading in a little bit of everything these days. Eventually, Judy and I will rebuild the Wood Thrush Books website so that we can sell new, used and remaindered books by other publishers there along with the titles that I publish. All nature-related stuff, of course. Stay tuned for that. In the meantime, I’m hustling to make this business fly. Wish me luck.